Showing recent results 4321 - 4335 of 4375 products found. Compact tabletest bench is used for quick and quality diagnostics of starters, alternators and voltage regulators without applying any additional measuring devices. 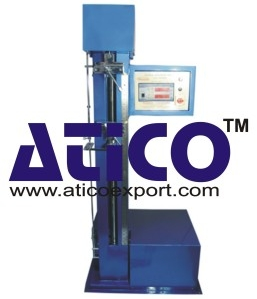 The test bench possess high power, thus, units can be diagnosed under different loads. 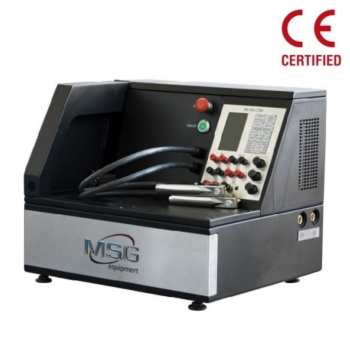 The equipment has small dimensions, it can be placed both in small service centers and big shops specialized in selling equipment.The bench includes the following diagnostic functions: testing of 12V and 24V alternators under load, 12V and 24V voltage regulators, 12V and 24V starters in idle running mode.Power supply is single-phase 220V, thus, there is no need industrial power supply.The device carries out testing of different alternators under load up to 100A.Connection of the 2nd battery is conducted from outside to the terminals on the bench body to achieve power supply of 24V for more convenient connection. Thus, usage of the 2nd battery is optional.New algorithms of testing have been implemented, meter accuracy has also been improved. ETS-200T / ETS-200T-FT - Teradyne, Inc. 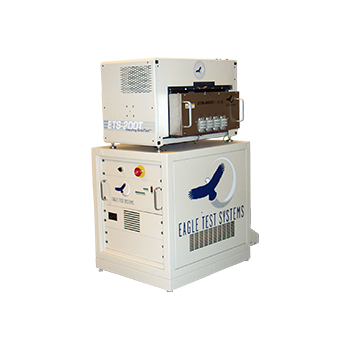 The ETS-200T / ETS-200T-FT discrete test platform is built on proven ETS technology and provides true index-parallel testing specifically for turret and rotary handlers. These test systems maximize throughput with pattern-based test techniques based on Eagle SmartPin™ technology coupled with the use of dynamic Cbits for enhanced user control. Both the ETS-200T and the ETS-200T/FT provides a complete test solution from wafer sort to final test for MOSFETs, including integrated control and datalogging for UIL, dVSD, Qg and LCR meter. Raptor™ software reduces program generation by providing a graphical user interface that does not require any programming experience combined with a robust set of test libraries and proven test techniques to increase test volumes and reduce cost of test. 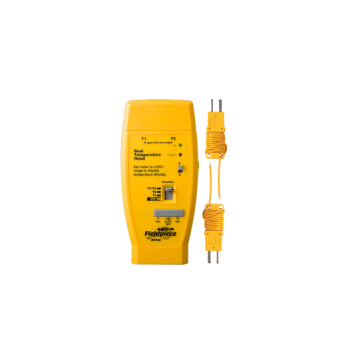 The Fieldpiece Dual-Temperature Accessory, model ATH4, measures two temperatures simultaneously using the included k-type, wrap tab beaded thermocouples. The technology inside the ATH4 provides superior temperature compensation in rapidly changing environments commonly found while performing field service. Use the ATH4 to find Delta T and just about any temperature split you want to measure. 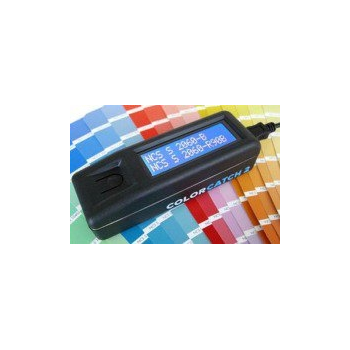 Displays T1, T2 and T1-T2 on your Fieldpiece meter, handle or data logger. It is included with the HVAC Guide® System Analyzer to get target superheat and for the Target Evaporator Exit Temperature test. Fieldpiece offers a wide variety of k-type thermocouples for various HVAC specific applications. Use pipe clamp T/Cs with the ATH4 to check for blocked filters. CLEN096 has similar structure as CLEN062 but its performance has been significantly improved. Comparing to 062 CLEN 096 bandwidth is 5 times wider (5M vs 1M) and sensitivity is 10 times higher (10mV vs 0.1V). Particularly, its frequency meter has been greatly enhanced. It can measure frequency higher than 20MHz at sensitivity better than 0.2Vpp (062 can only take 5 - 6 MHz signal and requires TTL level). Another big improvement is that CLEN096 is battery-powered. Accepted voltage ranges from 2V to 5V so one regular 3.7V Li-ion or two 1.2V Ni-HM batteries can be used. It also comes with a built-in charger specific for 3.7V li-ion battery. CLEN096 has built-in USB-Uart converter which easy-off firmware upgrade and waveform upload. It can also run on USB power without battery. ETS Solutions slip tables are designed to provide the optimum test platform for horizontal testing with any shaker combination. Two types of slip table are available to the user; a Unibase concept provides a structural steel body to align the shaker and table on a rigid platform, while a standalone slip table design allows the feasibility of any vertical shaker from ETS or other manufacturers to couple with the slip table assembly.All slip tables are designed with a precision ground natural granite slab with a selection of guidance bearings to meet different applications and budgets. 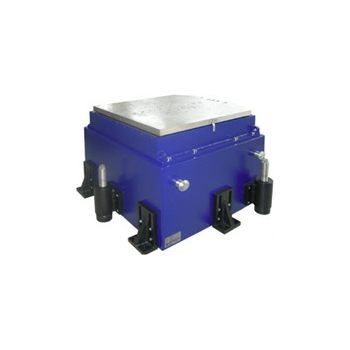 Slip tables can be provided in almost any size from 12 in (300 mm) square for small shakers to 8 feet (2.5 meter) square for the larger shaker systems. Different types of restraining bearings are available to meet different application requirements and operating budgets. 1. The underwater tilt sensor combines high-precision and real-time remote communication capabilities to monitor the tilting posture of underwater structures or slowly moving objects. 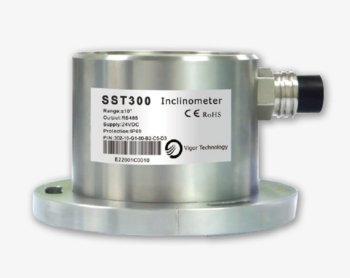 The high-performance SST300 marine inclinometer is fixed in a rugged, waterproof enclosure that works stably up to 3000m underwater.2. The stainless steel casing is processed and welded. Each product meets the high pressure test and provides extreme endurance in a long-term underwater high pressure environment. The cable and socket are a submarine-grade connector that provides water resistance of water depths exceeding 3,000 meters.3. This unit provides ±0.1%FS cross-axis sensitivity and ±0.01° combined absolute accuracy. It is a real high performance product.4. In order to solve the installation error caused by underwater installation, the sensor adopts “mounting alignment deviation” to reduce the installation error. The sensor can be mounted directly on a horizontal, vertical or inclined surface. 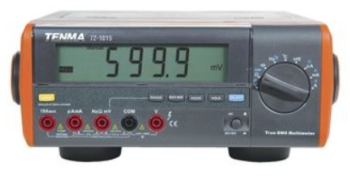 The 72-1015 CAL from Tenma is a digital bench type true RMS multimeter. It has auto and manual range options with maximum reading of 5999 counts and 3-5/6 digits which has a unique outlook design. In addition to all the conventional features including DC/AC voltage, current, resistance, diode, continuity test, diode test capacitance, temperature, transistor, max/min, there is a data hold, low battery display, sleep mode, RS232C serial port for easy connection with computer to realize macro recording, monitoring and capture of transient dynamic data, displaying change of waveform during the measurement, providing data and evidence to engineering technicians for scientific research. This meter complies with the standards IEC61010, pollution degree 2, overvoltage category (CAT I 1000V, CAT II 600V) double insulation and CE marked. The 72-7745 CAL D from Tenma is a hand held digital multimeter. It is a true RMS 4000 count auto ranging digital instrument featuring stable performance, high reliability and overloaded protection for all ranges. The orange and grey coloured meter is designed with large-scale integrated circuits and dual integral A/D converter as the core which can measure AC & DC voltage, AC & DC current, resistance, diode, continuity, frequency/duty cycle and temperature. The 72-7745 is double moulded for casing to ensure perfect insulation and offers backlit function to facilitate measurements on dark sites. In addition to the conventional measuring functions, there is a RS232C standard serial port equipped with model 72-7745 for easy connection with computer to realize macro recording and monitoring and capture of transient dynamic data, displaying change of waveform during measurement, providing data and evidence to engineering technicians for scientific research. 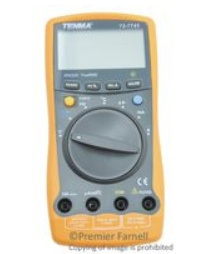 The 72-7745 CAL from Tenma is a hand held digital multimeter. It is a true RMS 4000 count auto ranging digital instrument featuring stable performance, high reliability and overloaded protection for all ranges. The orange and grey coloured meter is designed with large-scale integrated circuits and dual integral A/D converter as the core which can measure AC & DC voltage, AC & DC current, resistance, diode, continuity, frequency/duty cycle and temperature. The 72-7745 is double moulded for casing to ensure perfect insulation and offers backlit function to facilitate measurements on dark sites. In addition to the conventional measuring functions, there is a RS232C standard serial port equipped with model 72-7745 for easy connection with computer to realize macro recording and monitoring and capture of transient dynamic data, displaying change of waveform during measurement, providing data and evidence to engineering technicians for scientific research. 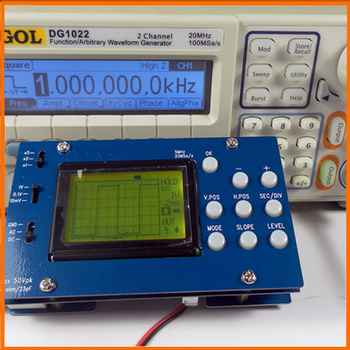 The 72-1015 CAL D from Tenma is a digital bench type true RMS multimeter. It has auto and manual range options with maximum reading of 5999 counts and 3-5/6 digits which has a unique outlook design. In addition to all the conventional features including DC/AC voltage, current, resistance, diode, continuity test, diode test capacitance, temperature, transistor, max/min, there is a data hold, low battery display, sleep mode, RS232C serial port for easy connection with computer to realize macro recording, monitoring and capture of transient dynamic data, displaying change of waveform during the measurement, providing data and evidence to engineering technicians for scientific research. This meter complies with the standards IEC61010, pollution degree 2, overvoltage category (CAT I 1000V, CAT II 600V) double insulation and CE marked. 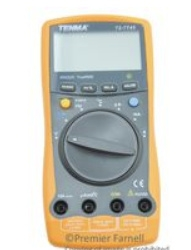 The 72-1015 CAL DU from Tenma is a digital bench type true RMS multimeter. It has auto and manual range options with maximum reading of 5999 counts and 3-5/6 digits which has a unique outlook design. In addition to all the conventional features including DC/AC voltage, current, resistance, diode, continuity test, diode test capacitance, temperature, transistor, max/min, there is a data hold, low battery display, sleep mode, RS232C serial port for easy connection with computer to realize macro recording, monitoring and capture of transient dynamic data, displaying change of waveform during the measurement, providing data and evidence to engineering technicians for scientific research. This meter complies with the standards IEC61010, pollution degree 2, overvoltage category (CAT I 1000V, CAT II 600V) double insulation and CE marked. 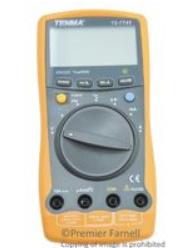 The 72-7745 CAL DU from Tenma is a hand held digital multimeter. 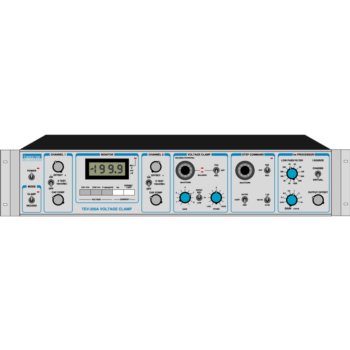 It is a true RMS 4000 count auto ranging digital instrument featuring stable performance, high reliability and overloaded protection for all ranges. The orange and grey coloured meter is designed with large-scale integrated circuits and dual integral A/D converter as the core which can measure AC & DC voltage, AC & DC current, resistance, diode, continuity, frequency/duty cycle and temperature. The 72-7745 is double moulded for casing to ensure perfect insulation and offers backlit function to facilitate measurements on dark sites. In addition to the conventional measuring functions, there is a RS232C standard serial port equipped with model 72-7745 for easy connection with computer to realize macro recording and monitoring and capture of transient dynamic data, displaying change of waveform during measurement, providing data and evidence to engineering technicians for scientific research.